At the bottom of my laundry basket, the one I load clean clothes in to fold, has a small pile of unmatched socks. It is functional, and sometimes we actually find their partners, but I like this idea from Brittany a thousand times more. 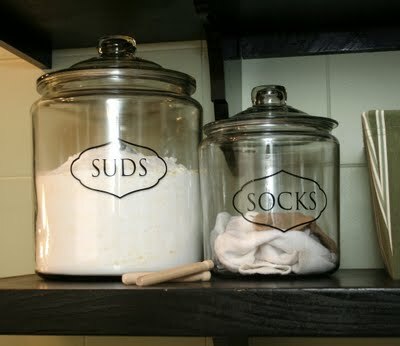 Next to her jar of homemade laundry soap, she has another pretty jar for lost socks. That way she and everyone else know where to find them. And it makes the laundry room cute too. You can get the recipe for her homemade laundry detergent and see more of Brittany's laundry room over at The Painted Parsonage. That is genius. A lost sock jar... I am so doing that. Really cute idea! Much better than what my husband does...he puts the singleton in the drawer! Grrr...the socks never find their mate! That's a great idea -- especially for the handknit socks that occasionally lose their buddies! lol that's a really cute idea! A jar??? As if all our singletons would fit in a jar. Maybe a giant garbage can. . . .